Gay travel websites often advertise cities as gay-friendly, which is a great way to find a good lesbian holiday destination as well. But we all know gay travel isn’t quite the same as lesbian travel. A lot of cities have a vibrant gay nightlife and a nearly non-existent lesbian nightlife. The Belgian capital Brussels is a great example of that. It has dozens of gay bars and no lesbian bars. 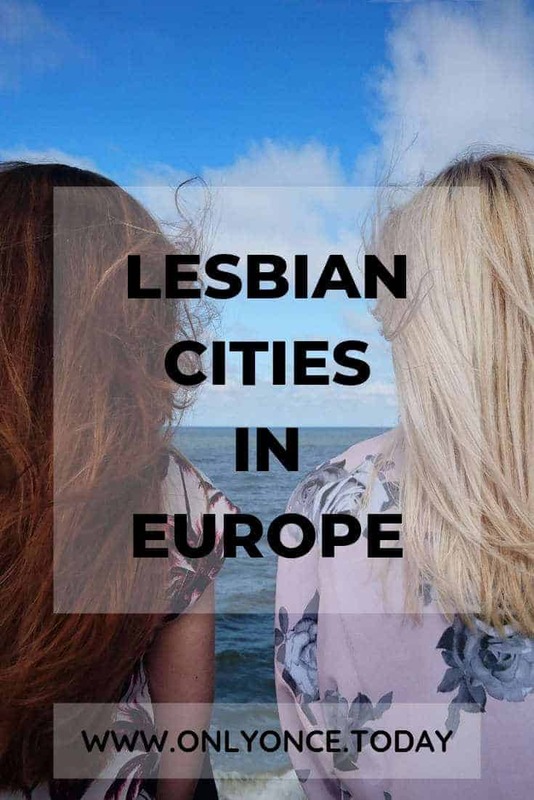 Keep reading to find out which are the best lesbian cities in Europe. We started this lesbian blog because it can be difficult to find information about lesbian travel. World Pride Host 2017 is on top of our LGBT-friendly cities list. But the Spanish capital is gay-friendly year round. The Chueca Barrio is where most gay bars, restaurants, and clubs are located. In addition to mostly gay Chueca, the Bohemian Lavapiès offers more female-oriented activities in lesbian Madrid. Check out this article on lesbian bars in Madrid. There is also a feminist bookstore in Madrid, called Libreria Mujeres. On top of that, there even is an adult toy store that is female oriented. To find out more about lesbian Madrid, read this guide on being a lesbian in the capital of Spain and more in particular, about the Lavapies area. Dear Hotel is a newer hotel, but it has a lot to offer. Enjoy the sunset view from the rooftop pool and lounge area. Hotel Sidorme Fuencarral 52 is a hotel that recently opened in a renovated building in the city center. This hotel has serene and beautiful rooms! The Petit Palace Chueca is located in the middle of the action and is also LGBT-friendly. These are the most budget-friendly places in Madrid: Hostal Puerta Del Sol is an LGBT-owned hostel in the city center of Madrid. Hostal Pizarro is also an LGBT-friendly hostel, which welcomes all LGBT travelers. Hostal Colors is another LGBT-friendly accommodation in the city center of Madrid. One of the most gay-friendly cities in Europe is Berlin. It’s also a great lesbian travel destination in Europe. The hipster city attracts thousands of gays travelers each year to attend different gay events. Berlin Pride lasts two full weeks and is an LGBT traveler favorite. The Berlin lesbian community is quite large and spread over the entire city. If you’re looking for a great lesbian party in Berlin, check out the monthly L-Tunes and Girls Town party dates. As for LGBT-friendly accommodation in Berlin, check our recommendations below! But Airbnb also has thousands of listings in Berlin. If you sign up for Airbnb with our link, you’ll get a discount on your first booking and we’ll get a discount too. Read more about gay Berlin here! Berlin is literally bulking with LGBT-friendly hotels and accommodation. Hotel Berlin is a part of the Pink Pillow Berlin Collection. It looks stylish and cool! The Vienna House Easy is another beautiful hotel in the Pink Pillow Berlin Collection. Hotel Sachsenhof is a traveler favorite, queer or not. This place also welcomes pets! We usually enjoy NH Hotels a lot, so the NH Berlin Kurfürstendamm Hotel definitely belongs in our recommendation list! Make sure to check out the Pink Pillow Berlin Collection if you’re looking for more recommendations! Most travel guides label the city of Amsterdam with words that make Google’s ears whistle. Doesn’t matter if you’re gay or straight, Amsterdam offers a lot of adult-rated activities for everyone. The yearly Gay Pride or Canal Pride is a little different than most Pride events. The Pride Parade is held with boats and floats on the cozy Amsterdam canals. The gay scene in Amsterdam is mostly mixed. As for the lesbian party scene: Cafe ‘t Mandje is a popular lesbian bar in Amsterdam, which is more of a traditional and old school bar, but it has been around for a very long time and it is still one of the top lesbian cafes in Amsterdam. Cafe ‘t Mandje is not for women only, but it has a large female and lesbian clientele. Three or four times a year, Garbo for women organizes an awesome lesbian party in Amsterdam. First of all, we want to recommend this lesbian owned B&B in Amsterdam: Flores&Puck. It’s not a hotel, but a private rental. The Conservatorium Hotel and the De L’Europe Hotel are 2 stylish hotels set in ancient buildings. Both are LGBT-friendly accommodation options. Hotel Espresso is a more budget-friendly accommodation just outside the city center. It’s a beautiful and LGBT-friendly hotel. If you want to stretch your budget a little further, check out the LGBT-friendly Hotel Freeland or the Ibis Centre Hotel. The lesbian scene in Stockholm is thriving. There isn’t really a gay neighborhood and queer bars, restaurants and clubs are scattered over town. The 2018 EuroPride was held in Stockholm and Gothenburg. Bitter Pills is a lesbian-owned LGBT bar in Stockholm and they regularly organize LGBT parties. The best time to visit Stockholm for queer parties is summer since a lot of open-air parties and the Pride Parade are organized in the summertime. Club Moxy is the most popular lesbian bar in Stockholm and they have their own Pride Party for women as well as other events throughout the year. An extra plus is the magical location of Stockholm and the abundance of nature close to the city. All of Scandinavia is super LGBT-friendly, so you won’t have trouble finding a good LGBT-friendly hotel that welcomes everyone. Miss Clara by Nobis is a beautiful hotel in the center of Stockholm, which is very LGBT-friendly! The Haymarket Hotel is another interesting option. This hotel has an awesome central location and it’s set in a house from the ’20s. Hotel Skeppsholmen is located by the water and offers great views over the city. Langholmen Hotel is a very cool hotel that is set in an old prison. Manchester is a well-known gay destination, as well as a lesbian holiday destination in Europe. The original and legendary tv series “Queer as Folk” was filmed in Manchester. The city counts a lot of gay facilities and lesbian parties the popular lesbian club in Manchester: Vanilla Club. The queer village in Manchester is located on Canal Street, where you can find a lot of lesbian bars and LGBT clubs. In the UK, London is also a popular lesbian holiday destination. Stay at this community-owned hotel in Manchester. Ready to spend some money? The Velvet Hotel Manchester is a luxurious and stylish hotel in Canal Street in Manchester. ABode Manchester is set inside a historic building, which looks really cool and prices for this LGBT-friendly hotel are very reasonable. REM Hotel is a very budget-friendly hotel near Canal Street. It doesn’t get the highest rates on Booking, but it is cheap though. In the hotel bar, you can regularly attend drag shows and comedy shows. Looking to stay budget-friendly and still stylish? Try the YHA hostel, which is probably the best LGBT-friendly hostel in Manchester. Denmark has always been a gay-friendly destination and it’s also a top lesbian holiday destination. The Scandinavian open attitude towards homosexuality can be witnessed in LGBT-friendly Copenhagen. With a wide variety of LGBT bars, clubs and restaurants, Copenhagen has something to offer for everyone. You can even book an LGBT historical walking tour in Copenhagen. Recommendation for lesbian travelers: Vela Club is a bar for women in Copenhagen. Denmark is extremely LGBT-friendly, just like the other Scandinavian countries, so each hotel you decide to stay in, is a great choice. These are the LGBT-friendly hotels in Copenhagen we recommend. Park Inn Hotel by Radisson is pretty close to the airport, but it’s still just 15 minutes away from the city center. Andersen Hotel and Urban House are two LGBT-friendly hotels. They’re located in Vesterbro, one of the cool neighborhoods in Copenhagen. As Denmark can be a pricy destination, you might be interested in the cool Generator hostel, which is a budget-friendly and LGBT-friendly option. Across the water from Copenhagen, you can find Malmö, it’s easy to combine both of these top lesbian cities in one Nordic trip. Malmö is the third biggest city in Sweden and it’s a real queer hotspot. Lesbian breakfast is the next big thing in Sweden and you can do it in Malmö on Sunday mornings with Lesbisk Frukost. But on other days, you can always have your breakfast or any other meal at the BeeBar, a straight-friendly kitchen, and bar. Check out this lesbian guide to Malmö for more information on lesbian bars and activities. Malmö has a lot of great Airbnb listings. If you sign up for Airbnb with this link, you’ll get a discount on your first booking. Malmö is just as LGBT-friendly as every other city or town in Sweden. So you can rest assured that you won’t run into any trouble as a lesbian or gay couple. These are the best scoring hotels in town: Hotel Duxiana Malmö, Mayfair Hotel TunneIn, and The Mill Hotel. All of these are LGBT-friendly and reasonably priced. Still looking for a more budget-friendly option? Try the STF Malmö City Hostel and Hotel. Athens has been a lesbian holiday destination for ages and a lot of lesbian bars and clubs can be found in this ancient city. Even though gay places still outnumber the lesbian options, there are quite a few lesbian bars to be found. The Greek Lesbian Webpage offers a lot of information on the subject. Noiz Club is the most popular lesbian bar in Athens. To make your lesbian Greek holiday complete, Destination Damselfly offers lesbian-oriented tours and holiday packages. Greek pride is also organized in Athens each year. Athens has quite a few LGBT-friendly hotels and lesbian-friendly hotels to offer. First of all Hotel Fresh is located near the city center and it has a rooftop pool. Some have a great location near the LGBT scene of the city, like the A for Athens Hotel and the Plaka Hotel Athens. Melia Athens and New Hotel Athens are both LGBT-friendly hotels in Athens and they are both beautifully designed and decorated. As you can see, some destinations definitely qualify as lesbian cities in Europe. Found another great lesbian city? Let us know so we can add it to our list of lesbian cities in Europe! PreviousLesbian night life in Playa Del Carmen – Does it exist? Great suggestions, I was just surprized not to see Barcelona on the list, it has a girly circuit and everything! I love that you call out that men and women do experience destinations differently; you’re totally right. Gay men have it easy when finding a “gay friendly” spot to visit. Women do really have it harder in almost every facet of life, even picking travel. But, um, lesbian breakfast? Is that the answer to to totally rampant gay brunch? It’s brilliant and needs to catch on everywhere. FYI, Seattle’s a great spot for EVERYONE all the time! We’re blessed to live in such a great spot. Right! There are gay bars and hotels everywhere. It’s difficult to find places for women… Seattle, must remember that 😉 Thanks! So cool! I think I will go with friends too, might see you there! Yes! 😀 Sweden is a beautiful country! Great roundup of destinations! It’s interesting that you point out gay vs. lesbian and the different experiences each have – I had never thought about that but I am sure it’s true. Great resource, thank you for putting it together! Munich used to be one of those cities that had men’s only gay bars, but it’s been great to see events specifically for lesbians popping up all over the place. Great list of some amazing and welcoming cities! Yes! And we hope to discover much more events for lesbians in the near future! 🙂 I guess I need to check out Munich too! We just got back from Berlin, Prague, Brussels, and Amsterdam and had the hardest time trying to find lesbian friendly spots. We stayed in a gay area in Berlin, and all the clubs had “Men Only” stickers on the doors. It was so upsetting to feel shut out even in a glbtq area of a large city. So disappointed in the queer community globally. It’s very difficult to find lesbian places. It seems a lot of LGBT places are men-only… 😢 but we will be doing more research and try to find all the lesbian spots! Thanks so much for this very informative list! You should check out Mallorca as well, we organise there since 6 years the ELLA International Lesbian Festival held twice a year and the local government has been very supportive to promote Lesbian Visibility! In any case we love the blog and highly support your work, thanks a lot! Hi, Can anyone recommend a safe place to travel to in Euro for single black/mixed woman looking to swirl around end of April this year?? Hi Inge! Thank you for your list… Would you like to know the lesbian side of Lisbon? Please, try it… I live here and it’s totally safe… Thanks a lot.